Central banks in the US, Europe, and Japan purchased many trillions of dollars of assets in an effort to hold down their interest rates and stimulate their economies. The Fed described these operations as ‘large-scale asset purchases’, and they were often referred to in the business press as ‘quantitative easing’ (QE). In the US, asset purchases were implemented in three phases between 2009 and 2014, commonly labelled QE1, QE2, and QE3. What did these purchases accomplish? Notes: Sum of Federal Reserve holdings of Treasury securities, mortgage-backed securities, and agency debt, plus unamortised premiums less unamortised discounts, Wednesday values, in billions of dollars. It’s also interesting to examine the market response to the statement issued after the Federal Open Market Committee’s next meeting on 29 April. In this statement, the Fed did not announce any changes in its planned asset purchases, and indeed the Fed eventually implemented all the purchases exactly as announced on 18 March. But just as a dramatic drop in the 10-year rate followed the 18 March announcement, Figure 3 shows that the rate jumped up significantly following the 29 April announcement. What about this second announcement caused the rate to jump up? One possibility is that the market was expecting the Fed to announce additional asset purchases on 29 April and was disappointed that none was forthcoming. But if this is the correct interpretation, it means that the drop in rates in Figure 2 should not necessarily be interpreted as the effect of the Fed’s actual LSAP programme, but instead corresponds to a potential effect of purchases that the market believed the Fed might end up making, but in the end did not. A more important factor is that the Fed made substantial changes to the words it used to describe the economic situation in its 29 April statement compared to the 18 March statement. The 29 April statement added phrases like “the pace of contraction appears to be somewhat slower,” “[h]ousehold spending has shown signs of stabilising,” and “although the economic outlook has improved modestly since the March meeting, partly reflecting some easing of financial market conditions, economic activity is likely to remain weak for a time.” There are two alternative interpretations of why changes like these in the Fed’s stated economic outlook could make a difference for bond prices. One view is that bond traders already have all the information that the Fed does about economic fundamentals. 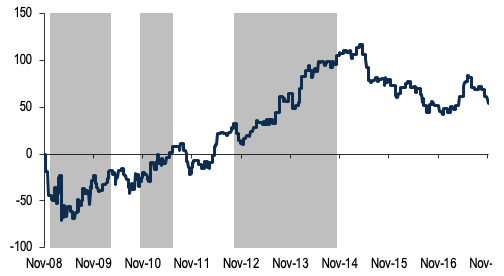 The one thing traders do not know is the Fed’s perception of those fundamentals. When the Fed communicates that it is more optimistic about fundamentals than traders expected it to be, it signals that monetary policy in the future could be more contractionary than markets anticipated. For example, the market may be led to believe that the Fed will raise short-term interest rates sooner than previously anticipated. This is the maintained assumption of most economic research making use of the response of interest rates to Fed announcements like that on 29 April. An alternative view is that bond traders know some things about economic fundamentals that the Fed does not, but the Fed also knows some things about fundamentals that traders do not. If that is the case, then when the Fed announces it is more optimistic, that would rationally lead traders to revise their own assessments of economic fundamentals upward. Stronger economic fundamentals would also lead to higher interest rates in their own right (e.g. Miranda-Agrippino and Ricco 2018, Melosi forthcoming). Analyses by Romer and Romer (2000) and Faust and Wright (2009) concluded that the Fed does indeed have some information that private traders do not. Campbell et al. (2012) found in data prior to 2007 that when the Fed raised rates relative to market expectations, Blue Chip forecasts of unemployment went down, exactly the effect predicted by the second interpretation (economic fundamentals have improved), and exactly the opposite to the effect predicted by the first interpretation (the Fed will be more contractionary than anticipated). Analysis of subsequent data that corroborates the Campbell et al. (2012) conclusion was reported by Nakamura and Steinsson (2018), Miranda-Agrippino and Ricco (2018), and Lakdawala and Schaffer (2018). If new information about favourable fundamentals was a factor in the market’s response to the 29 April announcement, it raises the possibility that new information about unfavourable fundamentals, in addition to news of LSAPs themselves, was a factor in the market’s response to the 18 March announcement. Note moreover the scale of Figures 2 and 3. The 10-year rate began the day on 18 March at 2.97%, but began 29 April 29 at 3%. In other words, some kind of news arriving between the meetings – whether about the economy or about the Fed – led to a complete reversal of the dramatic drop observed at 2:15 on 18 March before the Fed next met. The assumption behind high-frequency event studies is that we can isolate the effect of monetary policy by using a narrow window around announcements like that on 18 March. According to this interpretation, monetary policy lowered the rate by up to 50 basis points on 18 March, but some other series of shocks caused it to go back up 50 basis points over the next month. Advocates of this view argue that the interest rate would have been 3.5% rather than 3% on 29 April had there been no QE1. Consider applying this philosophy to the 2016 US presidential election. Vote counts on the evening of 8 November delivered the surprising news that Trump would win the election. Stock futures fell 5% that evening, only to regain all the losses by noon the next day. A devoted believer in high-frequency event studies would conclude that the election of Trump did indeed reduce the value of outstanding capital by 5%, but that some other shocks added that value back the next morning. But a more natural interpretation is that investors did not fully understand on the evening of 8 November (and I would argue, do not fully understand even today) the full implications of a Trump presidency for equity values (Wolfers and Zitzewitz 2018). Just so, investors did not really know by 2:30 pm on 18 March (and I would again argue, may not fully understand even today), the full implication for bond prices of the Fed’s announced plans for QE1. Greenlaw et al. (2018) tried to isolate the effect of Fed news itself by mechanically considering every day of an FOMC meeting, release of FOMC minutes, or speech by the Fed chair about monetary policy or the economy. 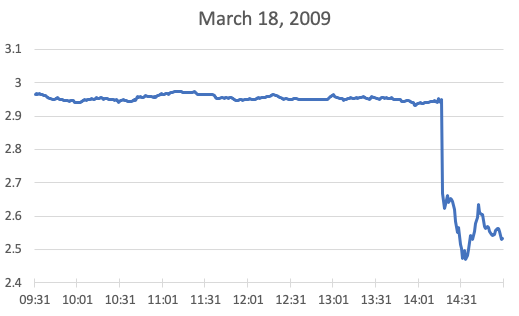 We called these ‘Fed days.’ Figure 4, adapted from that study, shows the cumulative change in the 10-year yield that came from Fed days alone since 20 November 2008. 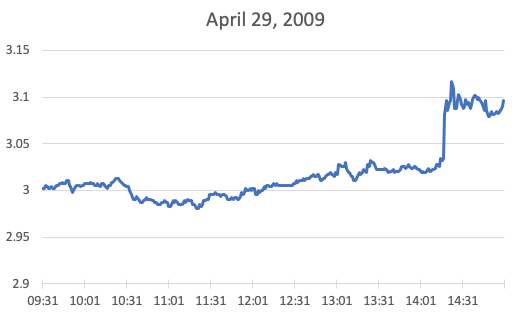 After some initial moves down in the Fall of 2008 and 18 March 2009, the subsequent overall impact of Fed news during QE1 was to raise, not lower interest rates. The same is also true of both QE2 and QE3. 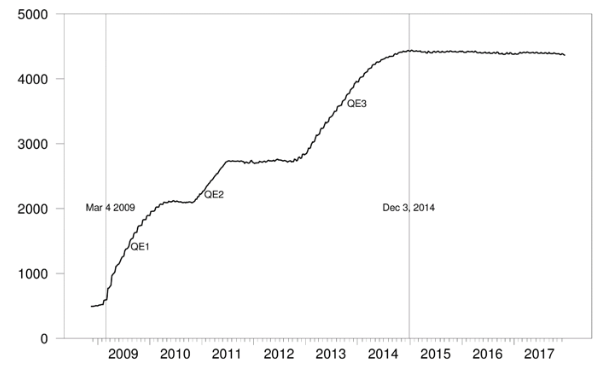 Notes: Shaded regions denote periods of bond purchases under QE1 (1 January 2009 to 31 March 2010), QE2 (3 November 2010 to 30 June 2011), and QE3 (1 October 2012 to 29 October 2014). Greenlaw et al. (2018) used another approach to isolate the effect of Fed news. Every day that there was a change in the 10-year rate of more than one standard deviation, we read the Reuters bond-market wrap-up for that day to see whether the news report pointed to monetary policy or some other factors as driving the market that day. Our overall conclusion from this approach was similar to that in Figure 4. Another example that persuaded many analysts of the importance of the LSAP programme came on 22 May 2013, when Bernanke raised the possibility that the Fed could soon reduce the volume of net bond purchases each month. 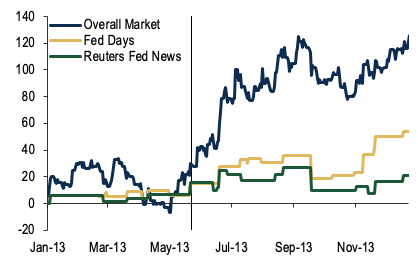 The 10-year yield rose 11 basis points on that day, and the upward move in rates that month is sometimes described as the ‘Taper Tantrum.’ But according to either our Fed Days or Reuters Fed News Days measures, the primary factor driving rates up at this time was not monetary policy (see Figure 5). For example, the Reuters’ bond wrap-up identified the strong employment report on 3 May as the primary factor driving rates up 11 basis points on that day, and a strong consumer sentiment report as responsible for the seven basis-point rise on 17 May. Notes: Vertical line is at 21 May, the day before Bernanke’s warning. Source: Greenlaw et al. (2018, Exhibit 5.3). The particular Fed LSAP announcements that are most often discussed in the economic literature all came at times when market participants (and the Fed itself) were reassessing evidence from a variety of sources – news of deteriorating fundamentals in November 2008 and March 2009 and of improving fundamentals in May 2013. Indeed, those revised assessments about fundamentals were why the Fed issued its key policy announcements at the time. By considering market moves only within a narrow window around the time of the announcements, we can reasonably claim to have isolated an effect of the announcement itself. But this unfortunately still does not resolve the basic identification problem of whether the announcement mattered because it conveyed information about what the Fed was going to do or information about economic fundamentals. Having raised these concerns, let me emphasise that I have been discussing here only the LSAP programme itself, and have said nothing about the emergency lending programmes that the Fed initiated in the autumn of 2008. Bernanke (2018) reviewed evidence of the importance of the latter. My remarks should similarly not be construed as implying that the LSAP programme had no effects on interest rates at all. My conclusion is rather that it is harder to measure these effects than is often supposed, and that the currently popular approach based on high-frequency event studies faces significant interpretive challenges. I think the case is strong that these Fed announcements contain at least some information that is important as a signal about economic fundamentals rather than a pure signal about monetary policy. To the extent that is true, it suggests that the effect of the LSAP programme itself on interest rates is likely smaller than many previous estimates. Bernanke, B S (2018), “The real effects of the financial crisis,” Brookings Papers on Economic Activity 2018(2). Campbell, J R, C L Evans, J D M Fisher and A Justiniano (2012), “Macroeconomic effects of Federal Reserve forward guidance,” Brookings Papers on Economic Activity 2018(1): 1–80. Eggertsson, G B and M Woodford (2003), “Zero bound on interest rates and optimal monetary policy,” Brookings Papers on Economic Activity 2003(1): 139–233. Faust, J and J H Wright (2009), “Comparing Greenbook and reduced form forecasts using a large real-time dataset," Journal of Business & Economic Statistics 27(4): 468–479. Greenlaw, D, J D Hamilton, E Harris and K D West (2018), “A skeptical view of the impact of the Fed’s balance sheet,” NBER, Working paper 24687. Hamilton, J D (2018), “The efficacy of large-scale asset purchases when the short-term interest rate is at its effective lower bound,” Brookings Papers on Economic Activity 2018(2). Lakawala, A and M Schaffer (2018), “Federal Reserve private information and the stock market,” Michigan State University, working paper. Melosi, L (forthcoming), “Signaling effects of monetary policy,” Review of Economic Studies. Miranda-Agrippino, S and G Ricco (2018), “The transmission of monetary policy shocks,” Bank of England, working paper. Nakamura, E and J Steinsson (2018), “High frequency identification of monetary non-neutrality: The information effect,” Quarterly Journal of Economics 133(3): 1283–1330. Romer, C D and D H Romer (2000), “Federal Reserve information and the behavior of interest rates," American Economic Review 90(3): 429–457. Wolfers, J and E Zitzewitz (2018), “’The standard error’ of event studies: Lessons from the 2016 election,” AEA Papers and Proceedings 108: 84–89.